This article reflects on European borders and their everyday dynamics from a cross-border perspective. The article begins with a discussion of recent events that question current border policies in the European Union, reviews the literature on borders and border territories, and finally moves on to a discussion of the everyday effects of cross-border practices on the inhabitants of border spaces. Occasional reference is made to borders in the Americas to complete the picture of this topic. Although the issue of security is indeed relevant, we focus on the economic and social dimensions of cooperation. Three aspects are essential for border residents who attempt to use the advantages of the territories for their global nature: work, shopping, and place of residence. In conclusion, there has been a tendency toward the softening of borders and greater integration of border zones in the European Union. This article contains a literature review to facilitate reflection on cross-border practices in Europe. Given the range of sentiments that borders evoke and the “border crisis” reported almost daily in Europe,1 an in-depth and calm reflection is necessary, to which this article seeks to contribute by bringing into the frame the long, pioneering and “largely” successful experience of the European Union (EU) regarding the opening of borders and cross-border cooperation. The current trend toward what appears to be an “inward turn” among EU states has had various readings, whether political, social or historical. This article provides a spatial, socio-political and psychological analysis designed to contribute other types of solutions distinct from the inward turn. Such solutions, we believe, lie in cooperation between EU countries and, more precisely, between their border areas. Hence, we praise cross-border projects as pioneering examples of broader collaboration and consider such projects interesting subjects worthy of more in-depth analysis. This article, in the form of a reflection, presents a dual view of European borders. First the historical/functional view is based on a literature review on borders and various cross-border issues focused specifically on Europe; a second section presents some contemporary issues regarding methods of integration in border zones on the European continent. The article begins by describing the strong questioning of current European border policy and, after a review of the literature and primary concepts, proceeds to present some current proposals regarding the cross-border phenomenon, as those issues are being studied by European academia. This article is in part the product of research conducted under the European cross-border project known as Pyremed /Pirimed,2 which focused on the French-Spanish borderlands of the Mediterranean watershed. That project lasted until 2010 and established some positive cross-border practices that are also discussed here. Despite our desire to take a broad view of the issues mentioned, it was necessary to place certain limits on this article. One limit is that the cases illustrated here are nearly all confined to Europe, with some brief mentions of the Americas; the article is primarily concerned with examining European issues from a European perspective. Similarly, experiences of cross-border cooperation are offered from Europe and not other places around the world. In addition, we are more interested in the economic and social aspects of cooperation than security-related issues. We do not intend to omit this aspect; however, our expertise lies in another area, which extends as well to international cooperation beyond the borders of the EU. Finally, we are more interested in daily practices and what determines those practices than in grand projects or laws established to foster cooperation. Hence, we present some experiences with best practices favoring cross-border exchange and hope that readers in other parts of the world can appreciate the benefits of transferring these experiences to their own countries. Any European citizen in the Schengen Area, particularly in border regions, can attest to the practical role in daily life of the principle of the free movement of goods, persons and services that this space supports. Conversely, the same citizens have been surprised by the fragility of the political framework. This dichotomy is currently the case with the refugee crisis in the Middle East, which has reached European territory, a crisis that has been in the European media for several months and has created profound gaps and disagreements among Schengen countries, even, in some cases, the reintroduction of border checks. More than a few political commentators contend that the United Kingdom’s decision to leave the EU (“Brexit”) can be understood in part from the perspective of the national management of borders and migratory flow. The issue has gone so far that even France Stratégie, the French government think tank, has released a report calculating the economic damage that would be caused by reintroducing permanent border checks. According to this report, long-term losses for France would reach 10 billion Euros, and some 100 billion Euros for the entire Schengen Area. Meanwhile, the hypothetical reintroduction of border checks would have the greatest effect on tourists on short stays, exchange students, cross-border workers and transporting merchandise between countries (Aussilloux, 2016, p. 7). In early 2014, another event shocked the European public: Swiss citizens voted in a referendum to restrict immigration (European or otherwise), hence contradicting the principle of the free movement of persons consecrated by the Schengen Area. Since then, Switzerland has sought to resolve this contradiction by legal shortcuts; in fact, the government of that country should renegotiate treaties with the EU regarding the free movement of persons and immigration. The event was widely covered by European media because the referendum was a de facto setback to one of the most far-reaching rights established in the region in recent decades.3 One Spanish newspaper ran the headline “Switzerland Slams the Door on the European Union” (“Suiza da un portazo a la Unión Europea”) (Abellán, 2014); whereas a Swiss newspaper declared it a “Return to the ‘90s” (Kohli, 2014). The decision raised questions regarding the suitability of the measure given that the country’s economy requires foreign labor (skilled or unskilled) to maintain growth. Meanwhile, the situation led other European governments to reflect on the free movement of persons (Bassets, 2014) at a time when populism is increasing in Europe because of the economic crisis. Switzerland’s vote also caused despair among the European Commission, which observed that the free flow of people throughout Europe, one of the basic pillars upon which the EU was founded, has since begun to show signs of instability (Figure 1). Note: Shown in green are the areas that supported limiting immigration and in red, the opposite. 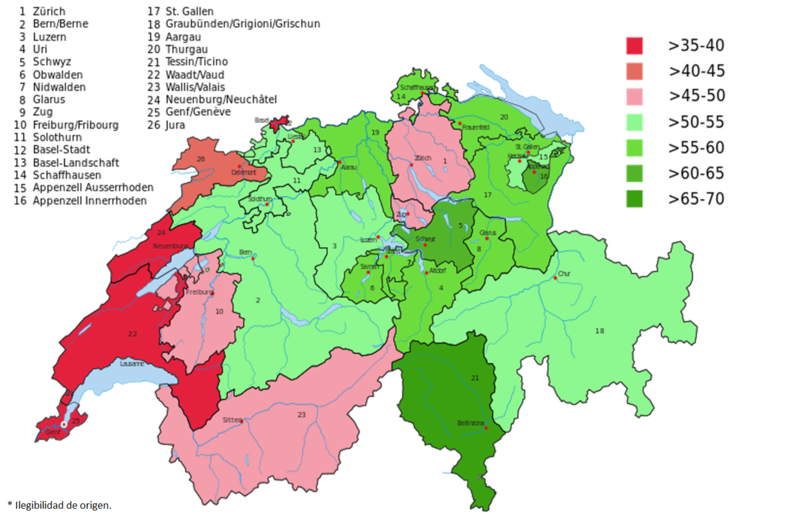 A clear division can be observed between the French-speaking areas in the western portion of the country and the large cities of Zurich and Basel compared with the rest of the country, which is far less reliant on foreign labor for its local economy. Note: The Swiss territories included in this area are shown in yellow and beige. 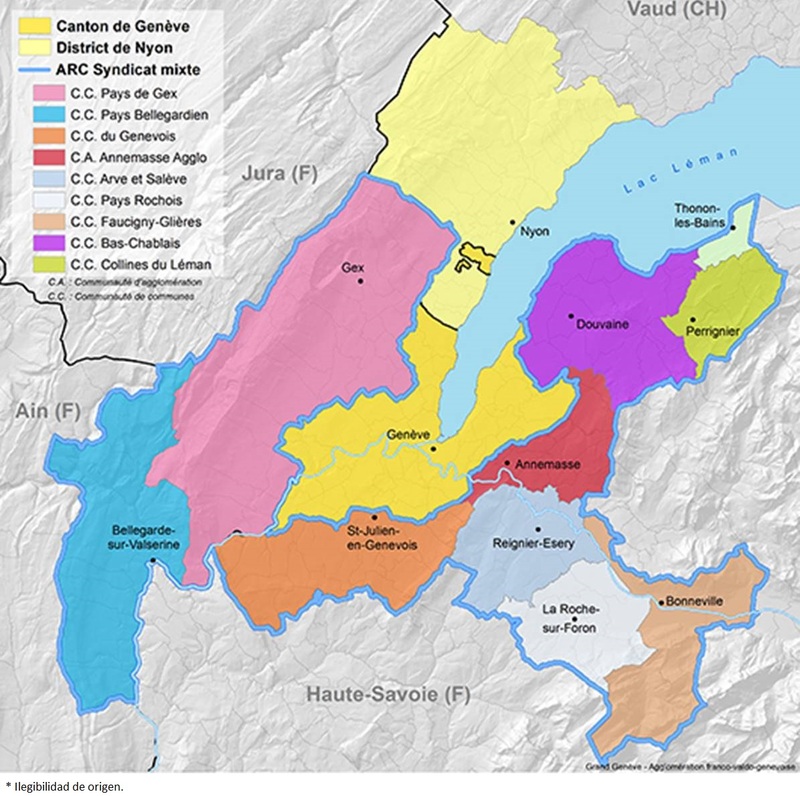 The rest of the territories are associated with French municipalities that compose Geneva’s metropolitan area. Source: Courtesy of Grand Genève. Photo: Swiss Air Force, 2013. If we look at the regional level in Switzerland rather than the metropolitan level, a good example of inter-regional cooperation in this country is observed in the natural and economic zone formed by Lake Constance in the northeast, which has for years been an important trade and development pole not only for the Swiss but also for citizens in three other countries bordering the lake: Germany, Austria and Lichtenstein. Switzerland is one of the countries in Europe with the greatest mobility of cross-border workers5 despite not being an EU member state, although Switzerland is a member of the European Free Trade Association (EFTA). Entering the country each day are 143 000 French workers, 62 000 Italians, 56 000 Germans and 8 100 Austrians, a total of 270 100 people. The Swiss population is approximately 8 million, with 23% being foreigners, the second highest in the EU after Luxembourg. In 2013, Switzerland received 80 000 immigrants, most hailing from other countries in Europe that were experiencing economic crises (Figure 4) (Poch, 2014). Note: As shown, France is the largest sender of cross-border workers. Switzerland sends a negligible number of workers to other countries and receives an influx of a total of 95,000 cross-border workers. Source: Courtesy of the Statistics Authority of the Canton of Basel, Switzerland (Regio Basiliensis, 2015, p.15). Given the economic and social importance of cross-border cooperation for Switzerland, few people anticipated the results of the referendum. These results, when analyzed thoroughly, offer clues to understanding external realities in Europe and the world (a small country’s fear of being diluted by the homogenizing force of Europe) and internal realities. The close results and voting patterns signaled an internal divide between French-speaking areas and large population centers on one side and other areas of the country. Meanwhile, the popular mandate broke with decades of Swiss integration with the EU, which was achieved thanks to its successive adherence to various European treaties on free trade and security. As an initial approximation, we might define borders as a component of the territorial and political structure of countries. However, in their current form, borders are also the product of how those borders have been understood by nation-states since their origins. Their function has basically been to serve as a line demarcating the sovereignty of a country, its defense and separation from the outside (cultural, commercial or military). Hence, borders have always been objects of more or less strict vigilance. These functions have made the border another instrument of national identity construction (Blake, cited in Dubois & Rérat, 2012). On an economic level, we may note the historical dilemma between protectionism and free exchange, a debate always blurred on the ground by contraband. Borders are the object of international law or political geography and as such have been studied at length; see Fawcett (1918) for a treatment of the principles of the last century from a geopolitical perspective, Sahlins (1990) for a historical-evolutionary description of French borders, and Gibler (2012) for an analysis of the border as a site of conflict. Traditionally, the borderlands have been sites of transit and multiple identities; and socio-economic processes do not necessarily coincide with the processes of the rest of the country. Quite often, these territories, located far from a country’s center, present notable social differences from the center and from the culture of the majority of a country. This last fact can be readily observed in France or Spain, for example, with their linguistically differentiated peripheries (Catalan, Galician and Basque in Spain; Basque, Catalan, German, Occitan or Breton in France). According to some authors, the borderlands often present their own somewhat strong identities as demonstrated along the US-Mexican border (Romo, 1987). Márquez and Romo (2008, p.1) quoted a resident of the US-Mexican frontier as saying, “There are three worlds here. You have the Mexican, the American, and the one here at the border, because here you have a combination of both cultures, and it’s different from the Mexican and the American.” Even in cases in which cultural and linguistic continuity exists, specific cross-border identities can emerge. This is true along the Colombian-Venezuelan border (Bustamante & Chacón, 2013) or in the Spanish-French region of Cerdanya in the Pyrenees (Moncusí, 2008, p. 63 ff.). However, it has not been our experience, in the PIRIMED project, that such identities arise. We believe the issue is about something much more basic, the abilities that inhabitants of border regions develop to know how to operate on the other side of the border, abilities that have more to do with the broadening of the geo-spatial environment than with creating mixed identities, as some have suggested. Another important aspect of border regions is security (a crucial military-strategic aspect) and its economic implications. The concept of the strategic border has been developed by various authors, and border areas have acquired greater military importance than other regions of a country. Hence, for centuries, such areas have had a strong military presence (an example is the series of forts designed by the French military architect Vauban along French borders in the late 17th century)6 and have been considered less secure. Following this logic, border territories have been perceived as economically disadvantaged compared with other portions of a country from a perspective of conflict; no nation chooses to locate key industries near its borders or plan great cities in these regions, and infrastructure and investments tend to be less pervasive. Petrakos and Topaloglou (2006, p. 153) presented this economic view: “Borders and border regions have been traditionally characterized as low opportunity areas hosting less advanced local economies.” This explains, in part, the economic dichotomy between the center and the periphery, which is quite extensive in the contemporary setting (Bertinat, Calvette, Ignatczuk, Sauval & Villamil, 2012). In countries such as Colombia, this dichotomy between the center and the peripheries has been illustrated with the figure of the golden triangle, formed by the cities of Bogotá, Medellín and Cali; a broader version is the golden polygon, which adds the cities of Bucaramanga and Barranquilla. The center-periphery bipolarity, with its three strands comprising culture, the economy, and the military, has traditionally marked cross-border areas, placing them at a clear disadvantage compared with other territories in the same country. This effect, combined with other factors, affects border areas and has been designated somewhat imprecisely in EU bureaucratic lingo as the “border effect,” which condenses the disadvantages of this region with respect to the rest of the country. Transnationalism challenges traditional visions of the nation-state, notions of sovereignty, concepts of citizenship, forms of political participation, and definitions of class and community. Transnational communities are both a cause and a consequence of heightened integration, and their existence must be understood and taken into account by policymakers on both sides of the border (Dresser & Wilson, 2006, p. 1). The dichotomy between a more closed border and a more open border continues today, although in different forms. In effect, the issue of borders can be viewed from the perspectives of security or economic integration. A single border can be viewed from both perspectives: reading the US border from these two angles are Ginsburg (2010) or Dunn and Palafox (2005) on the one hand and Vance (2012) and Brunet-Jailly (2006) on the other. Koff (2006) offered an excellent comparison of the two tendencies, arguing that the security perspective predominates in the United States whereas the economic integration perspective prevails in Europe as that perspective relates to internal borders. The issue of the view from the border and its representation in adjacent societies is no trivial matter. Raffestin (1992) emphasized the role played by the border as a component of the social and national fabric, which renders the European dream of simply abolishing borders more difficult. A scenario of closed borders or conflict zones underscores socio-economic problems (Díaz & Turner, 2012), issues of migratory pressure and its management (Ackerman & Furman, 2013; Campos, 2012; Chavel, 2013), or pure delinquency (Dube, Dube & García, 2013; García, Gaxiola & Guajardo, 2007), views that imply a militaristic idea of the border area, even sometimes impositions in matters of security by stronger nations on weaker nations, a source of irritation for some authors (Kent, 2011; Velasco, 2012). In the end, the EU also recognizes that the free movement of persons, goods, services and capital instituted in the Schengen Area can only be achieved in parallel with the initiative of the European Area of Freedom, Security and Justice (Fernández, 2004), thus demonstrating that the tension between liberty and security is fundamentally unresolved. An interesting development that has its origins in 1970s-era Europe is cross-border cooperation. This type of cooperation has a long history in some regions, for example in Basel, in which such cooperation has existed for half a century (Kreis, 2012; Weber, Jakob & Basiliensis, 2013). The short history of the opening of borders in Europe, which began in the early 1990s after the fall of communism in the Eastern Bloc, has suffered its highs and lows during the quarter century of its existence, which demonstrates the pervasiveness of the above-mentioned tension: a few early years of great enthusiasm gave way to skepticism and the placing of progressive limits on aspects of the free movement of persons (Amoroso, 2013). Yndigegn (2011), under the provocative title “Between debordering and rebordering Europe,” highlighted pendulum-like shifts in ideas surrounding this issue over the last quarter century in the Scandinavian region of Oresund. Nikiforova (2010) discussed the disappearance versus the reinforcement of borders, describing recent years in the cross-border zone between Poland, Lithuania and Belarus. McGuire (2013) similarly addressed the cycle or re-materialization of the US-Mexican border. It should be noted that in recent decades, European hopes have centered on the cross-border phenomenon, particularly at moments heralding social or historical new beginnings, as if the opening of border regions might contribute to this new beginning as a type of territorial expression of social enthusiasm. O'Dowd and McCall (2006) described cross-border cooperation as a means of reinforcing peace in Northern Ireland whereas Czyzewski proposed that cross-border practices can provide a path to reconstruction in Central Europe, stating, “I am inclined to agree with the opinion that working out a modern form of the borderland ethos will determine the future of Central Europe; it will define each integrative trend, including European integration” (Czyzewski, 2012, p. 173). Colombia is among the countries that still have large internal occupied borders. This fact, however, represents a contradictory situation. While from an environmental point of view the persistence in the early 21st century of large forested areas dominated by natural ecosystems represents something of global value, these same areas are the setting of unresolved social conflicts upon which the political future of our country largely depends (Andrade, 2004, p. 1). Another scientific perspective on the border comes from the concept of the social border, used by authors for many years to define spaces of socio-economic exclusion that are adjacent to more well-to-do areas, often within the same city (Soulet, 2010). There is also the concept of the mental border, which European scholars have utilized recently to attempt to explain why, despite the EU’s open borders policy, many citizens choose not to explore the advantages offered by the situation (Müller, 2014a and 2014b; Spierings & Van der Velde, 2013). This last group of studies is part of the arena of collective mental representations (Clémence & Lorenzi-Cioldi, 2005). To conclude this section, we briefly distinguish among four concepts of the territorialization of cooperation between countries. ‘Binational’ is used to refer to those projects and agreements conducted by two countries (or multinational if involving three or more countries) based on their sovereignty and common objectives and including such actions in determined geographic zones if the zones include border areas. Examples include binational agreements for the exploitation of natural resources. Castro, Cortez and Sánchez (2011) and the Acuerdo entre los Estados Unidos Mexicanos y los Estados Unidos de América relativo a los yacimientos transfronterizos de hidrocarburos en el Golfo de México of 2008 examined the exploitation of water and hydrocarbons, respectively, in the region along the border between the United States and Mexico.8 Binational treaties regarding issues of cooperation generally, or border areas in particular, do not exclude cross-border cooperation but can co-exist in a parallel fashion. The state is responsible for establishing an overall policy in land, insular and maritime border areas, preserving the territorial integrity, sovereignty, security, defense, national identity, diversity and environment in accordance with cultural, economic and social development and integration. Taking into account the inherent nature of each border region through special financial allocations, the Organic Law on Borders shall determine the obligations and objectives comprising this responsibility (Constitución de la República Bolivariana de Venezuela [Constitution of the Bolivarian Republic of Venezuela], Art. 15). However, Barrios and Rivas (2011) criticized a lack of fulfillment of this constitutional mandate as well as the Venezuelan government’s insufficient attention to border regions, which has caused economic and other types of weaknesses in these regions. Jiménez (2015) identified new and interesting forms of governance along the Colombian-Venezuelan border despite the difficult situation that currently exists between the two countries. Moving away from the national level, we observe inter-regional or cross-border cooperation, which occurs between the territories of one country and another, generally territories that are adjacent to a neighboring country. In addition, we assume ‘cross-border’ to mean those actions and projects that occur in the border areas of two or more neighboring countries. Here, the region is clearly defined and results from proximity to the border. It is possible to introduce, if one wishes, the cross-municipal level, which involves cooperation between municipalities that straddle (or are located immediately along) the border area, including cross-border metropolitan areas such as those of Geneva and Basel, mentioned above. These different scales coexist easily and raise only the questions of the optimal choice of both the territorial setting and the instruments of governance to be used for each project. In addition to inter-regional or cross-border cooperation, a novel concept that has been contributed by territorial cooperation in the EU is network cooperation, that is, cooperation established among territories that are not contiguous geographically but share common strengths or interests. We find ourselves, then, with an innovative territorial cooperation. This type of cooperation has been established, for example, between European cities known for producing ceramics or between several Mediterranean islands as part of the Archimed (Mediterranean Archipelagus) project. The former is a concrete cooperation proposal within one economic sector whereas the latter involves political and lobbying cooperation to promote the joint interests of the Mediterranean islands and ensure that their voices are heard in the EU. In sum, the advent of cross-border cooperation has contributed to an enormous change in the border paradigm that existed until the mid-20th century─providing a decisive push in Europe and subsequently in other parts of the world─that shifted from the regional (understood as a formal region) to the territorial, as explained by Ramírez (2011). Table 1 demonstrates these changes, indicating the evolutions occurring at different levels. This section summarizes some of the current debates surrounding the integration of border areas in Europe related to the context of territoriality and the spatial behaviors of residents in border areas, debates that remain open and hence will be the subject of reflection and research in the future. There are three spheres in which the inhabitants of border areas may benefit from the economic advantages offered in their space because of the opening of borders and the economic integration occurring in the EU in the last half century: work, shopping and housing. In terms of the first sphere, we will always see flows of cross-border workers toward the country that pays the highest salaries. An example is the cross-border spaces between France, Germany and Switzerland: France is a net exporter of labor whereas Switzerland is a net importer, despite the fact that the exchange is bi-directional in theory. The other two spheres─shopping and housing─spur movement toward the country that offers the lowest costs. An example of the former is Germans on the border with Austria crossing over to purchase fuel for home use. 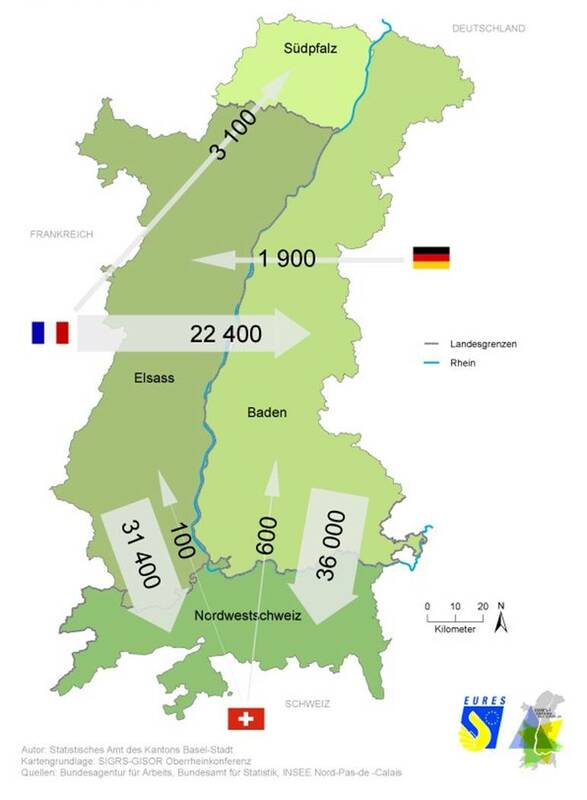 An example of the latter is the border between Belgium and Germany; many Germans reside on the Belgian side because of lower housing costs although their lives are centered more on the German side. Such situations were replicated along borders throughout Europe as soon as the borders were opened and for as long as the economic differences between the adjacent countries were sufficient to motivate these types of cross-border movements. Certainly, regional integration along borders depends not only on the opening of borders, as in the Schengen Area, but also on linguistic and cultural factors, which can have a strong effect: if the same language is spoken on both sides of a border, cross-border regional integration is easier. Topography also has an effect although the effect is secondary to linguistic and cultural considerations. Integration in border areas should be more social than economic. This statement is based on Müller (2014b), who rightly stated that economic factors alone are incapable of forging unity across borders. Although economic factors can initiate cross-border processes in the short- or medium-term if there is a critical mass of persons involved (generally workers or shoppers), only when social factors enter the scene (shared leisure time, competitive sports teams, schools with exchange programs, cultural associations with shared programming, etc.) does cross-border unity become real and lasting. In effect, low prices or products that can be acquired on the other side of a border are inevitably subject to volatility; what is cheaper on the one side one day can be cheaper on the opposite side the next. It is also true that the buyer-provider relationship is not the most lasting whereas social relations are, independent of economic fluctuations. Hence, integration is about creating spaces for human exchange and social communion in cross-border areas. It is preferable that cross-border processes be bottom-up rather than top-down. More than a few times have we seen grand agreements in the EU by government administrations at different levels that have led to projects that never reached critical mass. Resources have been invested in places in which, in the end, few citizens benefitted because the projects were driven from above and not from below. This author believes that individuals’ enthusiasm regarding the cross-border cause is required within public administration if integration is to advance. However, the enthusiasm of a few, even if those few hold positions of authority, is insufficient. It is necessary to conceive of projects with the potential to touch many lives to give European administration much greater visibility than is currently apparent. The cross-border project around the city of Geneva, one of the oldest in the EU (although Switzerland does not belong to the EU), has had a considerable effect for this reason: since the 1970s, the employment opportunities in Geneva have attracted French workers; these French workers work in Switzerland but prefer to live in their home country. This arrangement began a successful cross-border history. Authorities’ role was not in initiating, but in accompanying this process and regulating it a posteriori: based on an agreement between France and Switzerland in the 1970s, Geneva transferred some of the taxes collected from French cross-border workers to the municipalities in which those workers resided, allowing French municipalities to build an appropriate infrastructure for a growing population (Saint-Ouen, 2012). I am grateful to Jahir Lombana (UniNorte Barranquilla) and Wilson Ladino (ESAP Bogotá) for the information and comments given about geo-economic concepts of the “golden triangle” and “golden polygon”. 1As this article is going to press (November, 2016), a large refugee camp in the city of Calais in northern France is being dismantled. 2PYREnees MEDiterranee-PIRIneos MEDiterraneo, bilingual Frech-Spanish name of the geographical área covered by the Project. 3Switzerland is not a member of the EU but has signed some cooperation and free movement agreements with the EU, becoming part of the Schengen Area. 4Of course, these two Swiss cities are not the only cross-border urban areas in Europe: the European project known as URBACT has identified more than 60 cross-border metropolitan areas in Europe that are home to 25 million people. These figures give us an idea of the importance and also the challenge, within the EU, of correctly articulating all of these metropolitan areas to render them attractive and competitive, despite their fragmentation by national borders (URBACT, 2010). 5Technically, the European Union defines “cross-border workers” as persons who work in a neighboring country and return home to their country of origin at least once a week. This definition distinguishes cross-border workers from temporary migrant workers. In fact, however, many cross-border workers in Europe are daily commuters who cross the border daily to travel between home and their place of work, which is located in a neighboring country. 6It appears an irony of history that the forts and castles that once closed off territories have today become top tourist attractions designed precisely to increase the flow of people those structures once sought to bar. See the online bibliography of Les Fortaleses Catalanes, which studies and promotes (also in a cross-border manner) these edifications in the region of Catalonia. Meanwhile, the forts designed by Vauban have been designated UNESCO World Heritage Sites (Les Fortaleses Catalanes, n.d). 7See also Varela, Rojo and Sá Marques (2006) for a discussion of governance in the border region between Spain and Portugal. 8These and other areas can also be addressed with a cross-border focus, not simply a binational focus. For example, Uitto and Duda (2002) proposed this focus for resolving the issue of international aquifers. 9A multitude of proposals have been presented from different economic, social, political or cultural perspectives regarding manners in which to improve the effectiveness of cross-border cooperation and disseminate findings. These perspectives highlight the proposals by CECICN (2012) regarding improving cooperation to achieve second-generation territorial or smart territorial cooperation. ☆ Narcís Bassols. Spanish. He has been a professional technician in the Pyrémed-Pirimed project of the European Union. Doctorate at the Universitat Rovira i Virgili, Tarragona, Spain; Live in Barranquilla, Colombia and he is part of the Tourism and Hospitality Business Administration Program, Faculty of Economics, Administration and Accounting, Universidad Autónoma del Caribe. Research lines: tourism in border areas, urban and cultural tourism. Recent publication: Branding and promoting a country amidst a long-term conflict. The case of Colombia in Journal of Destination Marketing and Management, 2016. ☆ ☆José Rafael Correa Fernández. Colombian. Master´s in Management of Organizations in the Knowledge Economy, Universidad Oberta de Cataluña, Barcelona, Spain. Full-time professor a the School of Management, Corporación Unificada Nacional de Educación Superior, Seccional Santa Marta, Colombia. Research línes: ONG´s Internationalization and tourism in border areas. Recent publication: Marketing y comunicación de ONGs: el caso de Caritas Diocesana de Girona (Master thesis), Universidad Oberta de Cataluña, Barcelona, 2014.